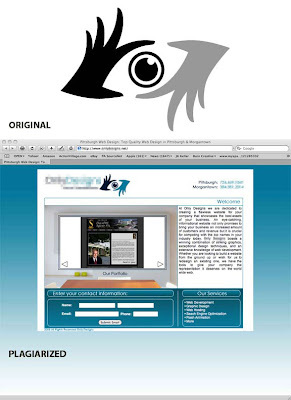 I'm writing this update since I still get e-mails from people asking me what ever happened with the situation where some web design company earlier in the year stole a logo I designed and used it as their own. After being informed that the logo I designed had been blatantly ripped off I contacted the owner of the company, (which is actually just a couple of guys) via email and asked them to stop using my design. The following are the e-mails we exchanged after that. established company. Please refrain from threatening me like a child. Established or not that is my logo you are using. I did not just start my business the other day either. Are you claiming that you created the logo? Or did you hire a designer to create your company logo who most likely took my work and sold it to you to make a quick buck. After that I got my lawyer to send a cease and desist letter to the thief and within a week the entire site was taken down. The last time a checked they had a brand-spanking new site, which by the way I quickly found out was created by using a template from one of those template websites. Ugh, the same thing happened to a co-worker of mine. A concert planning company took photos from his portfolio he had taken at a rock concert, and used it on a bill board for one of their upcoming shows. These were blatantly obvious, just like your logo. I try to make sure everything I do is copywritten, it is amazing how sleazy people can be.